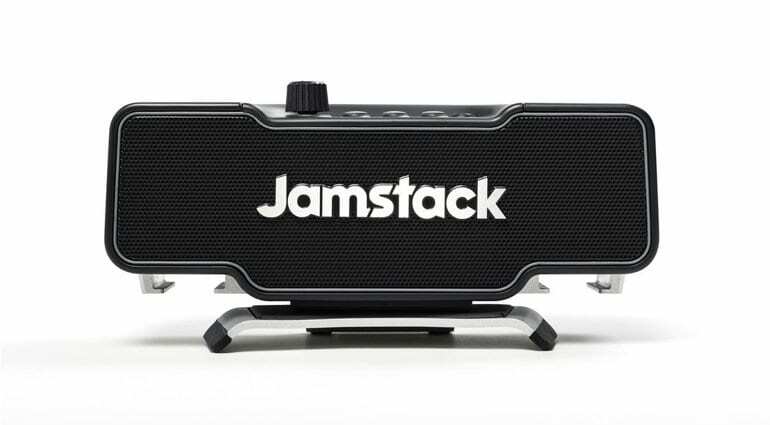 Jamstack is a Bluetooth-capable mini amp its inventors are calling “world’s first attachable guitar amplifier”. Given that we already have many nano amp products in the market, what does this solution do that’s different? So does this product deliver on its claim? Unless I am missing something, it is just a Bluetooth-enabled speaker with brackets attaching to your guitar and inputs for a guitar and a Line signal. So it’s not really a guitar amplifier as such, more like a very small PA/powered speaker. 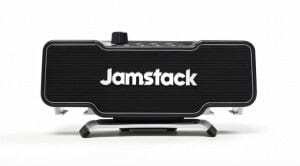 Jamstack has no guitar preamp or tone controls of its own and relies on third-party guitar amp software to generate the amp and effects tones. 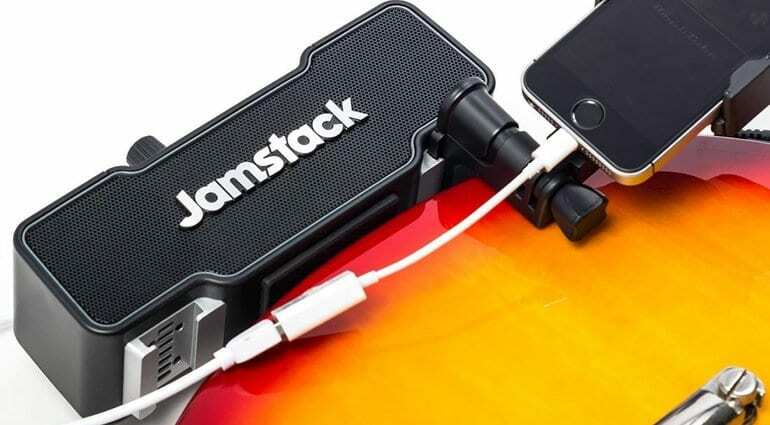 Jamstack – The world’s first attachable guitar amplifier? 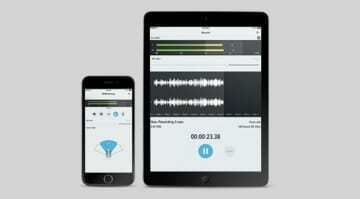 But Jamstack does have a built-in digital interface that processes effects from smartphone apps, making it different to the smallest speaker systems out there. The full-range speaker lets you jam along to tracks from your smartphone and practise your licks. It uses two 1.5-inch speakers and has up to eight hours of battery life, apparently. It’s rated at 10 Watts of power, which is decent for its size. That makes it a good fit for taking away on trips or just noodling on the sofa without the hassle of cables and amps plugged into the mains. I would suggest you take a peek at their product overview video below to see how it all works. At this price point, I’m not sure it will win that many players over. 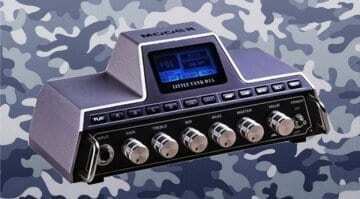 I would probably opt for a Blackstar Fly or similar nano amp product, as they cost less. 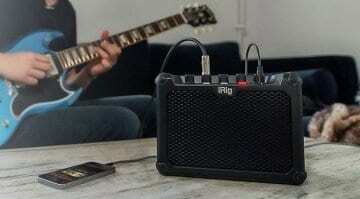 The recent iRig Micro Amp would be a better bet for many situations, I think, and is a lot less money. But one advantage the Jamstack brings to the table is brackets that attach to your guitar. That puts it into class of its own, albeit it a pricey one. You can use either an Apple iPhone or Android smartphone with this. 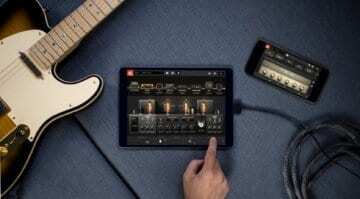 I think Jamstack should really have developed their own guitar amp app. That would help this product stand out from the crowd. Maybe its makers have envisaged this in a future product iteration. We’ll have to wait and see.